Savvy Rest is known for offering organic mattresses that are made with both comfort and health in mind. But if we’re sleeping on something safe and natural, shouldn’t our furry best friends have that same type of comfort? We weren’t impressed with dog beds on the market since we didn’t like the idea of our dogs sleeping on synthetic foams or cotton treated with pesticides. So, the idea of the Savvy Doggy bed was born. 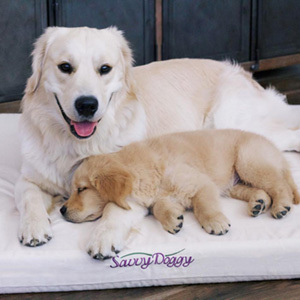 Our organic dog bed is made with the same Dunlop and Talalay latex found in our human mattresses. We always opt for natural latex because it’s both supportive and pressure-relieving. It also sleeps much cooler than memory foam, and it doesn’t involve any chemical flame retardants or formaldehyde, neither of which sound relaxing to us. 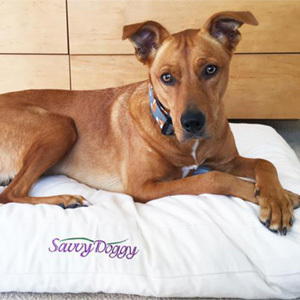 The natural dog bed is covered in an organic cotton flannel that is super soft, yet durable. You have the option of choosing between shredded and formed latex. The shredded latex dog bed has a height of about six inches. It can be compared to a bean bag chair in the sense that your dog can lean into the bed with the latex gently conforming to his/her body. It’s great for a dog that likes a plush bed they can sink a bit into. The shredded fill can be manipulated to move whichever way your dog wants it to. The formed latex bed includes an actual three-inch layer of supportive, medium/firm latex rather than shredded fill. This is a great option for someone looking for a lighter dog bed that has a more uniform feel. 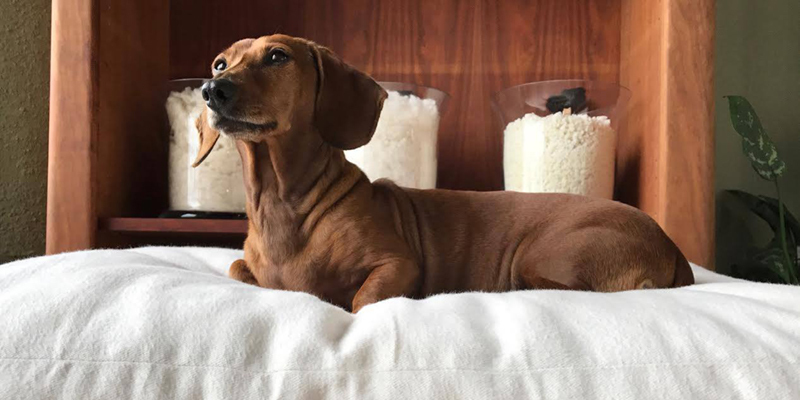 If your dog is a bit on the destructive side, it might be better to opt for the formed bed instead of the shredded—the formed latex will have less of a mess! We understand that our furry companions get dirty, especially after playing outside, so you can unzip the outer cover and hand wash it in cold water. We recommend line drying to avoid shrinking the casing. 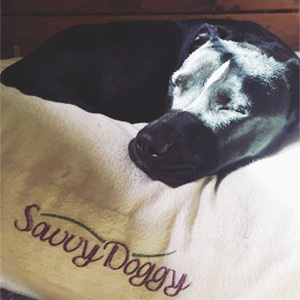 We’ve gotten overwhelmingly positive feedback about our dog beds (and some precious photos, too!). 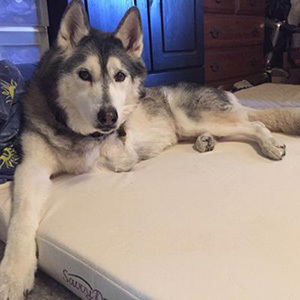 "I just wanted to let you know that we received our order of a large dog bed for our nearly 14-year-old Tripawd Siberian Husky—Bravo—who has been suffering from arthritis. He laid down on the bed this afternoon at 1:00 and hasn’t moved since! It is now 5:15. Usually, he has to get up, reposition, lie down, get up, try to find a comfortable position...and it goes on and on. I am so pleased with your bed! He loves it!" 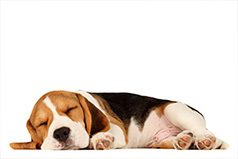 Does It Matter What Dogs Sleep On? The cheap foams and chemically-treated materials used to make most dog beds are bad for everyone. Do I Have to Pitch My Pet? Many of us find it hard to give up tucking in with Fido or Fluffy. Here's why. 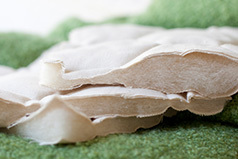 Learn more about the healthful materials in Savvy Rest products.